Melamine garage storage cabinets are more than just an addition to your garage, they are an investment in your home. As we covered previously, melamine offers performance similar to that of a solid wood cabinet, but it does it at a fraction of the price. Melamine offers performance similar to that of a solid wood cabinet, but it does it at a fraction of the price. Melamine cabinets differ from fiberboard in that it isn’t a composite material, and it doesn’t show wear and tear as quickly. In addition to being very structural sound, melamine is also very resistant to high temperatures, which is a major feature that is important because garages are known for getting very hot during the summer. In addition to its low cost and durability, melamine is also an ideal choice for custom garage cabinets because of the variety of finishes it is offered in, and the fact that it has a smooth and uniform look. So, if you want a finish that looks like wood, or something simpler like a solid color, melamine comes with those options. The point here is that no matter what type of finish you are looking for, melamine probably comes with that finish as an option. When you get custom garage cabinets you are investing in your home and adding value to it. While you are adding value to your home, you are still paying money out of your pocket to do so. That’s why you should ensure that you get the best value for your money. The best value doesn’t mean the cheapest material you can find, because cabinets made from cheap materials will end up breaking, which isn’t a good use of your money. Rather, value means getting high-quality cabinets at an affordable price. If this is what you are looking for, the melamine garage cabinets are an ideal choice for you. It’s important to hire a professional to design and install your melamine storage cabinets. 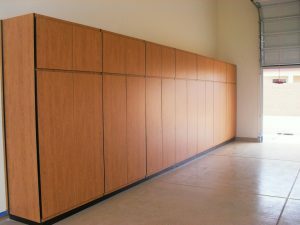 If you are going to get custom garage cabinets installed in your home, then choosing the right company to install them is just as important as choosing the right construction materials. A great contractor can make something impressive out of inexpensive materials, whereas a bad contractor can take the most expensive materials in the world and make something that is basically a pile of junk. You don’t want junk, do you? Then with that in mind, get professional garage cabinet installation in Phoenix.